Tattoos and the work place are a minefield - while creative industries tend to favour artistic expression more than corporate offices, there's a limit to just how far employees will stretch their policies regarding body modifications. If you think you regret that star/heart/music note tattoo you willingly got aged 17, spare a thought for this guy who may just be the (very ashamed) owner of the world's worst tattoo. Imagine the devastating reality of waking up after a heavy night on the sauce to look in the mirror and discover you've had the word 'DEVAST8' permanently tattooed across your face? Unfortunately for Mark Cropp that's the exact situation he found himself in one morning in prison. The former criminal from New Zealand was recently freed and now he doesn't understand why employees are so reluctant to offer him a job. Cropp is currently on the dole and desperately seeking employment which has so far been a fruitless search. 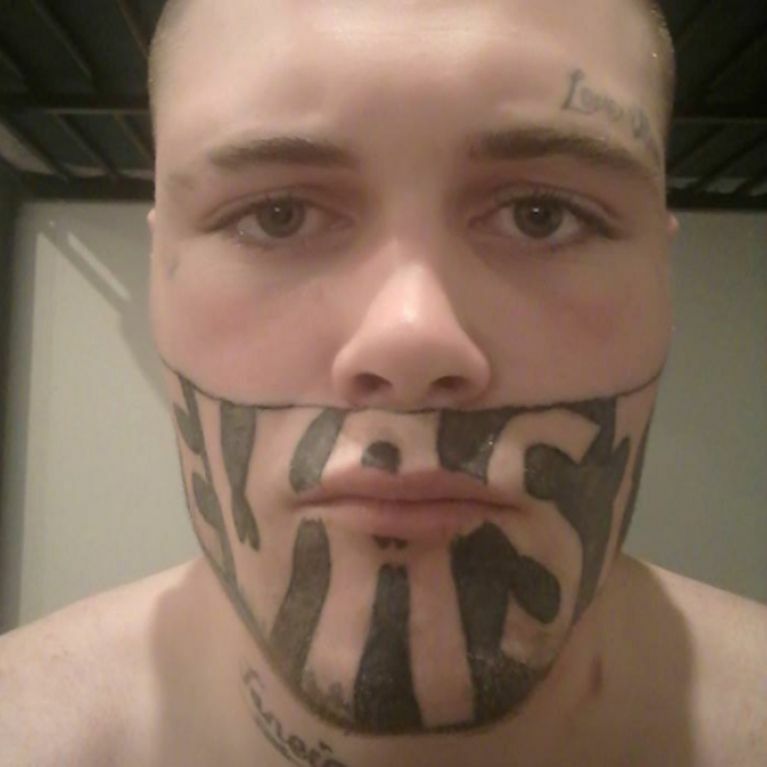 He wrote on a job-seekers website: "Hey I'm keen as to work but have one thing that is stopping me and that's my tattoo on my face I don't have a CV as of yet but have worked at NZ brick distributers before also a scrap metal yard. I'm 19 years of age and have my learner's license. Keen as on job or work place that will take me on. I have a CPIT qualification in painting and decorateing, Also chainsaw and fencing NZQA throw agribusiness (sic). Any questions please ask me." He recently shared his story on Facebook in a post which included a photo of the now-infamous tattoo and hopes it'll urge employees to look past it and see him as the "normal human being" he is. Cropp told the NZ Herald: "One employment place said to me: 'I wouldn’t employ you with that on your face, I wouldn’t even take a second look at you'. ​"I’ve had other people that just shrugged and laughed at me I was over people judging for my facial tattoo… that’s why I made the decision to put that photo on Facebook, to turn around and say 'I am just a normal human being, you do not have to judge me because of the way I look'." Cropp has also shared details of how the permanent facial marking came to be, revealing it was a bit of drunken fun between a few fellow prisoners that got out of hand. He said: "Before I knew it I had this on my face. It was swollen like a bloody pumpkin." Cropp was encouraged to go ahead with the tattoo by his brother, who was an inmate at the same prison, as he claimed it would be a deterrent to other prisoners. But despite his struggle to live a normal life, Cropp is not willing to have the etching lasered off. Cheryl Cole reveals huge rose tattoo extends all over her bum!